Diners are becoming more and more spoilt for choice when it comes to steak houses or restaurants where one can get a lovely piece of beef. However, most of these places are at the high end of the price scale, and one is left with American style chains in malls to enjoy an affordable, albeit unsatisfying, piece of steak. There is, therefore, a void between high end options and the bottom ones. That was until now. Choice Cut at the fairly recently opened Novotel on Airport road, part of the Al Bustan complex, intends to bridge that gap. This picture gives you a sense of the openness. when I visited Choice Cut recently, I was warmly greeted by the hostess on my arrival. 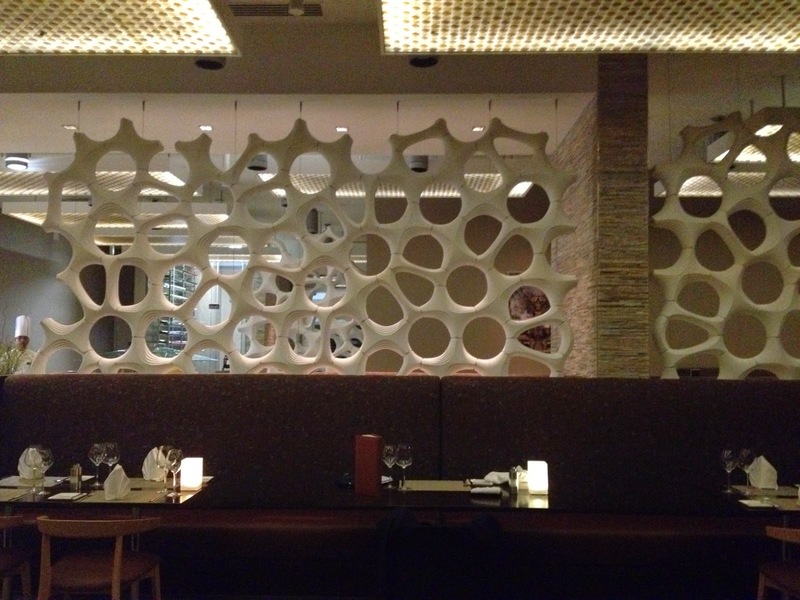 The first thing that made an impression on me was the spaciousness of the restaurant. In its present incarnation, it holds 112 diners, but this can easily be taken to 130 because there is ample space left for tables. On being seated, I was offered a lightly scented warm, damp hand towel. For those who follow my blog, you will know that I am a big fan of the little things in restaurants, and when an evening starts off like this, it often bodes well for the rest of the experience. 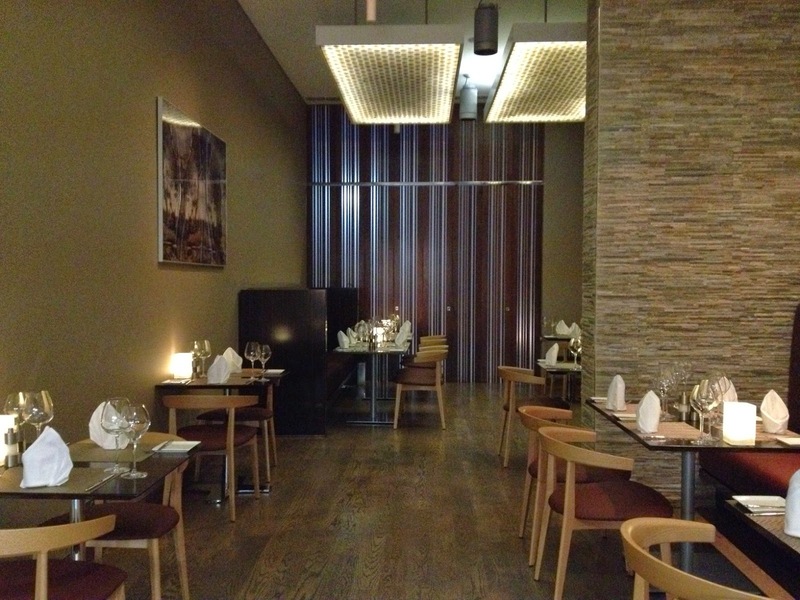 The concept at Choice Cut excludes starters in the traditional sense. 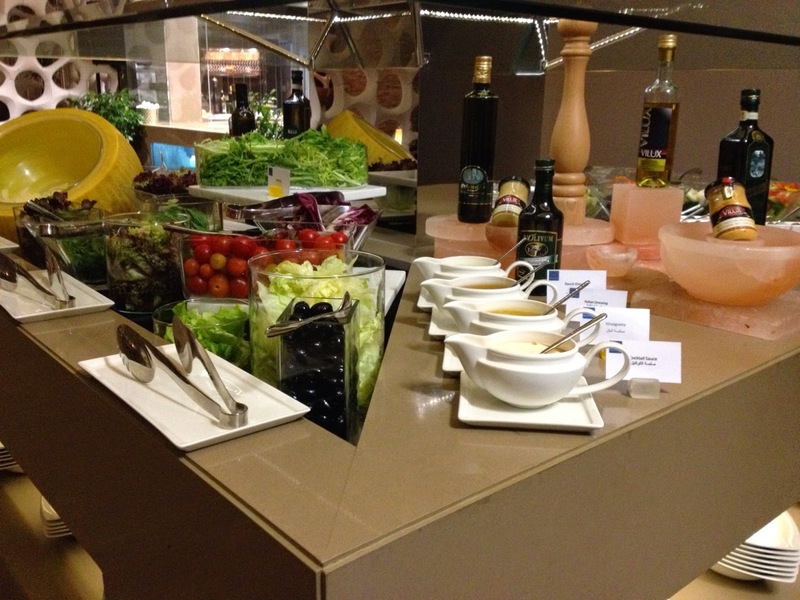 The idea is you choose the salad you would like and then your main which includes vegetables, potato and sauce. 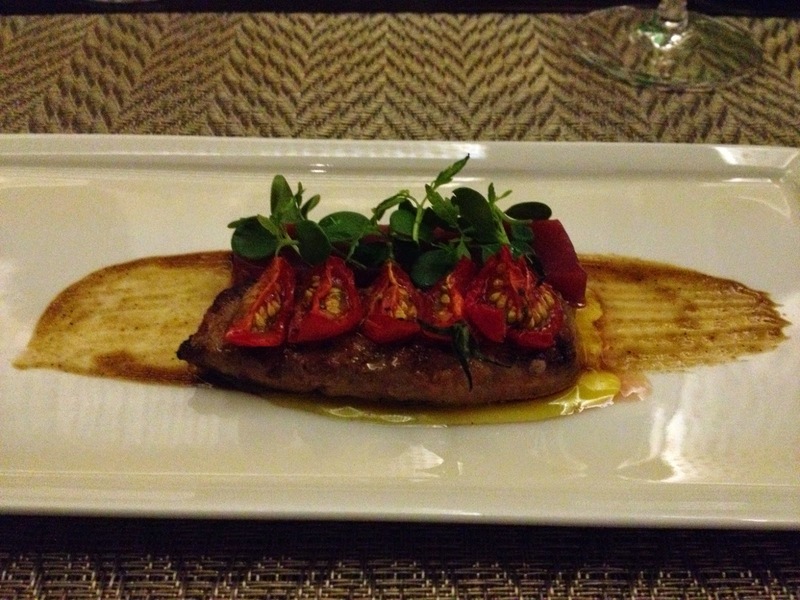 Interestingly, they also offer, at a very reasonable additional charge, foie gras which can be served with your beef as a course. 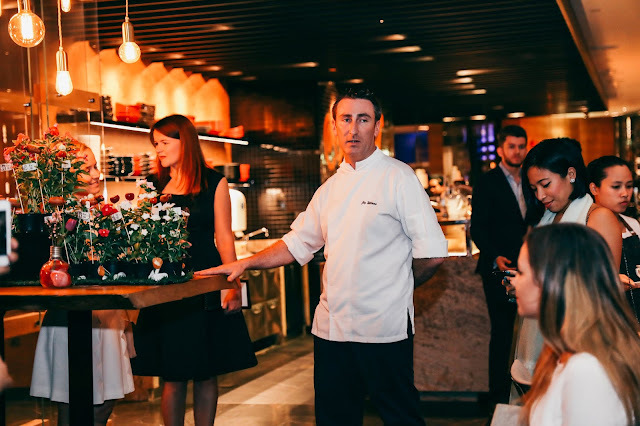 The menu, despite being unwieldy, offers tremendous value for money with options that include Australian Angus beef grain fed, French Beef grass fed and also Irish Beef Donald Russell. 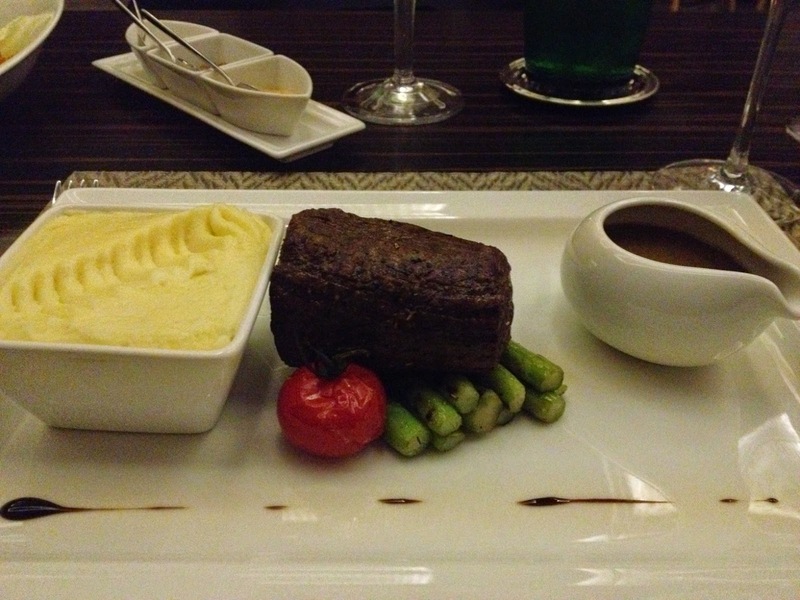 Finally, on the menu you will also find Australian Wagyu Grade 5 beef. Considering the prices you are paying for your dining experience, it is a nice surprise to see Grade 5 on the menu, again showing it is a perfect fit for the gap between the expensive steakhouse and the shopping mall. There are also a couple of sea options, with Chilean sea bass and salmon fillet available. To get the evening going, I am offered an amuse bouche of mint, yogurt and orange sorbet beautifully presented on ice. I enjoy it. I like the freshness and the coolness of it all. The mint, especially, is a delight. However, I can't help feeling this works more as a palate cleanser than an amuse bouche. .
Next, I have the foie gras topped with cherry tomatoes and with pomegranate jelly on the side - all on a pomegranate juice, honey and balsamic sauce. While my first impression is one of scepticism, I can understand what the chef is doing - the subtle sweetness from the tomatoes balancing out the liver taste of the foie gras. Unusual, but it works ok. The mash and truffles were so delicious. 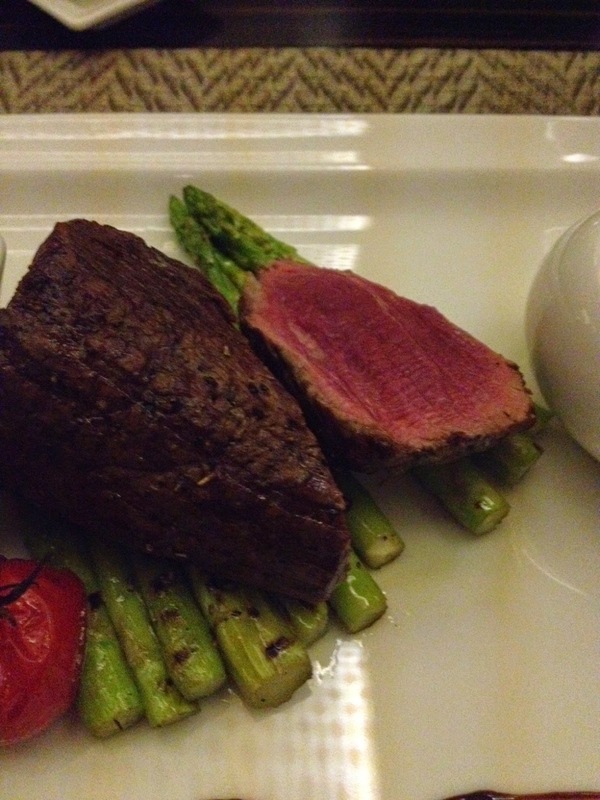 For my main the chef brings me the Australian wagyu tenderloin on asparagus. 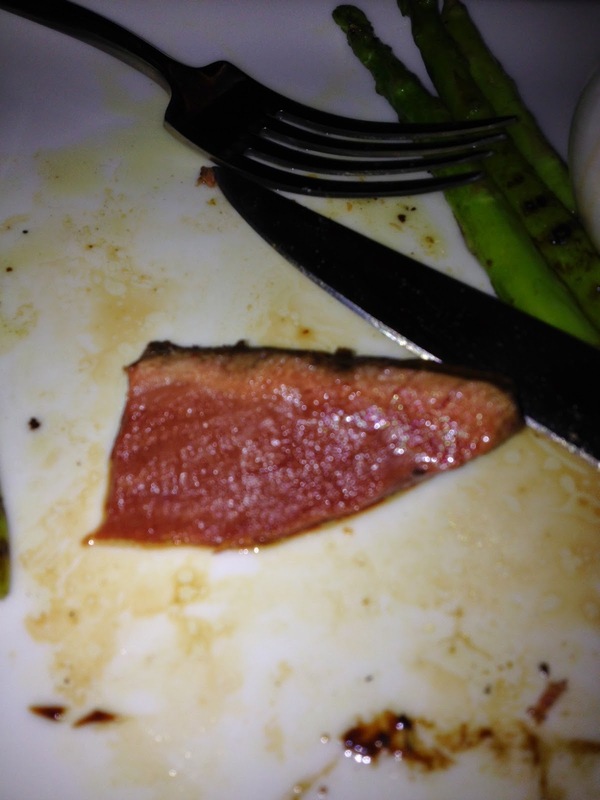 It is more rare than medium rare, but I must admit, I lap it up. The glorious pinkish colour reflects the tenderness as I put apiece in my mouth. On my plate I also have mashed potatoes with truffles. The consistency is just right, and the taste of the truffles makes it even better. The asparagus, finally, lightly sauteed, has an appealing crunchiness. Overall, a good dish. Having a sweet tooth, despite the lovely lingering beefy taste in my mouth, I go for dessert. I opt for the trio of fresh berries. The chilled berries shot is quite sour - I love it. The contrast with the sweet meringue is obvious. Texturally though, the meringue is not as crispy as it should be, but it is still a nice dessert with a tasty berries compote in the centre. The service is very attentive, at times too attentive, but I will rather have waiting staff err on this side. Staff are very engaging and friendly and I am looking forward already to my next visit. As for the wine list, Choice Cut has some decent wines in the 155-235 Dhs price range including a La Grand Chapelle Bordeaux 2012 as well as a very reliable South African Nederburg Reserve Cabernet Sauvignon. But if you want to spend a bit more, there are some other wines as well in the 300-500 Dhs range. like All in all, there are 10 by the glass options, more than adequate for a 4* hotel restaurant. Choice Cut, in conclusion, is an exciting steak house that plugs the gap between steakhouses offering cuts for 200-500 Dhs in 5* hotels and restaurants in malls. 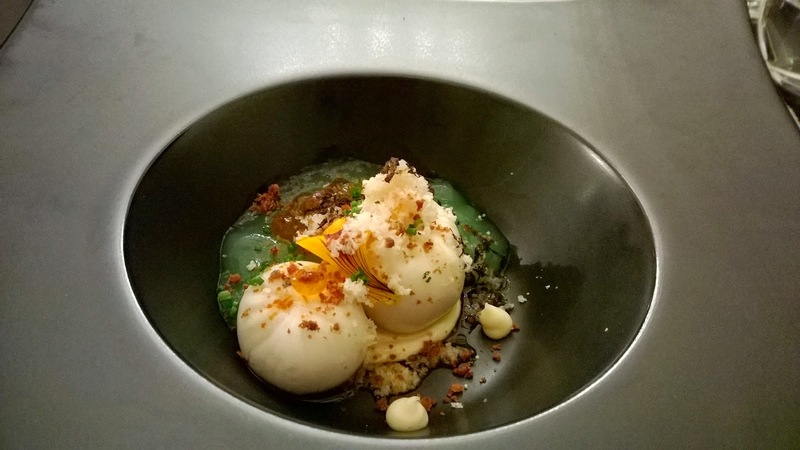 For significantly less money, you can get a dining experience with some nice beef, service that really aims to please - in a stylish and relaxed setting.